We have become a nation of bike riders. There has been a consistent increase in the number of cyclists in the country since the beginning of the millennium. It is not just the twenty-somethings either. People of all ages are getting out and about on their bikes. Whether for leisure, commuting, fitness or sport everyone from high school students to busy executives to retired seniors are strapping on helmets and pushing pedals. This summer, the Pan-Am 2015 games are taking center stage and with the building of the brand new state-of-the-art Velodrome in Milton, avid cyclers are not only anticipating the thrill of watching the competition but with access to velodrome facilities people are trying their hand at track cycling. If you have an interest, there are already lessons available for anyone curious about this sport which has now become accessible to us in the Southern Ontario area. For those of us with a cycle enthusiast in our family, this means more sports gear and a new bicycle to consider and store as well. Yes, the road bike purchased last year will not work for the sport of Track Cycling. Riders will need a track bike with no brakes and fixed gear. It is designed for racing on a track at a velodrome. The track is a banked wooden track so the bike is lightweight, aerodynamic for racing and high gear. These professional riders are reaching speeds of 80km/hr while many of us are cycling at 20km/hr on the road. Track biking is both a team and an individual sport and has its own set of unique rules and events. The following is what you can expect to see at this year’s Pan-Am games. The individual sprint where cyclists begin racing with a flying start (from a moving position rather than a stopped position), and race for 200 meters. The team sprint, which is slightly different for men and women. For men, three racers sprint over three laps of the course, with each rider participating in one lap. In the women’s event, it is two racers over two laps of the course. The Keirin sprint in which a motorbike is used to set the pace. The cyclists follow the pacer over a kilometer or two as it gradually increases in speed. When the pacer moves from the track, usually with about 700 meters left to go, the cyclists battle it out to the finish line. The endurance event for the Pan-Am games involves two teams racing at one time. The teams of four riders begin on opposite sides of the track and the race is completed over a distance of four kilometers. A winning team is declared when one team catches the other or whichever team finishes in the fastest time. Flying lap – Where cyclists complete one lap from a moving rather than a cold start. Points race – Which is a mass start marathon race, 30 kilometers for men, 20 kilometers for women. Elimination race – Where a rider is eliminated over a series of races. Individual pursuit – Where two riders compete over four kilometers (three for women) from a stationary start position. Scratch race – Which is a simple race where the riders start together and the first one over the finish line wins. Kilometer time trial – Where the cyclists are timed over the length of one kilometer (500 meters for women). If all of this makes you want to try out track cycling, there are already lessons offered at the Velodrome in Milton . People are also thrilled at the opportunity of all-year training. With the building of this facility, Canadian cyclists no longer need to worry about the weather. What Do I Need for Track Cycling? You’ll need a fixed-gear track cycle and a body hugging skin suit as well as an aerodynamic helmet all in an effort to reduce drag and get every little bit of advantage out of drafting behind team mates while on the track. Fixed gear means there is no coasting on this bike. The pedals are attached to the crank set so if the bike is moving so are the pedals. If we want to travel 10km then we will be pedaling the entire 10km. Think back to riding your first tricycle around the neighbourhood and you get the idea. There has also been a rise of other fixed gear bikes as city hipsters are bringing back retro no-gear bikes and riding them as commuter bikes. Track bikes are little more complicated but the basic idea remains the same. In addition to the lack of coasting, these bikes have no brakes, as streamline design is more important on these wooden track speedsters. Therefore, stopping is different than on a regular road bike. There are two ways to stop on a fixed gear bike. The skid stop – Think back to that tricycle again; you place backward pressure on the pedals so the back wheel stops spinning and skids to a stop. On a bicycle, you also need to remember to lean forward over your front wheel to improve the stability of your stop. Have brakes installed – Many cyclists have front brakes installed for increased safety on city streets and while learning how to properly ride a fixed gear bike. Surprisingly, with minimal technology, the track bike raced in a velodrome is still a bit heavier than a road bike even though, you would never see a spot to put a water bottle. In fact, water is not allowed on the wooden racing tracks. Chances are that if you (or someone in your family) has purchased a brand new track bike, there are already a number of bikes in the garage. 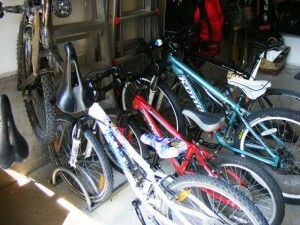 No doubt you have a mountain bike, a high-end road bike, a leisure bike and even a few bikes for the kids. Fortunately, there are innovative solutions to your bike storage issues that keep your wheels secure and easy to access and still leave room for the car and lawn mower. 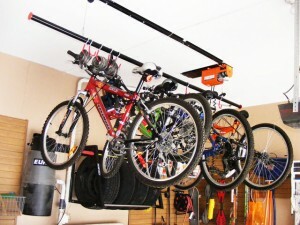 Automated bike lift on a pulley – This system can store up to five bikes at a time, raises them up to the ceiling, and out of the way, yet still keeps them easy to access. 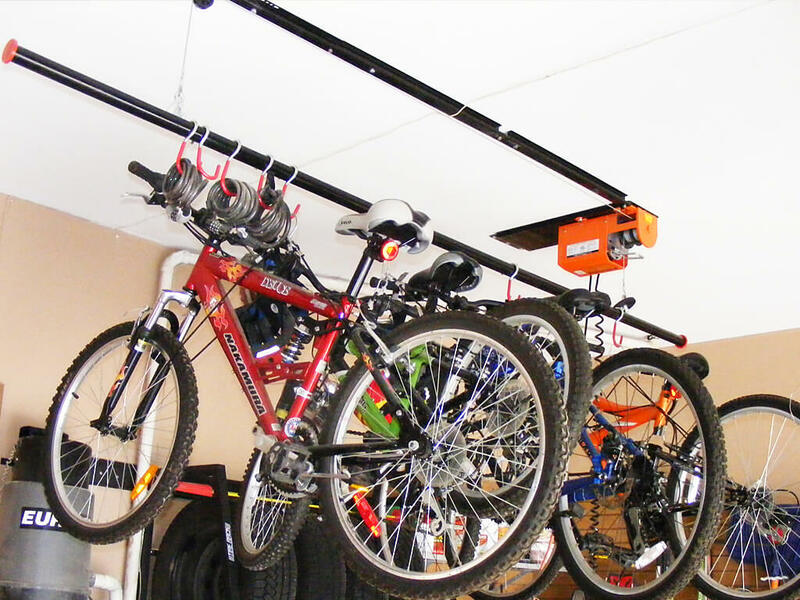 Ceiling mounts – If you have a tall garage, you can take advantage of the space up top and store your bikes overhead on ceiling mounts. School yard-type bike rack – This is the perfect solution for the warm months when everyone is riding. 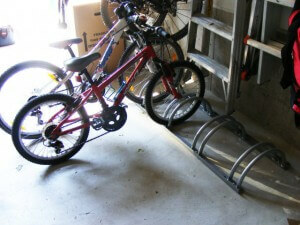 Park the cars in the driveway to allow this simple solution for bike storage. Easy to store, even for the kids. The best bet is to talk to an expert who can evaluate the space you have, the bikes you need to store and the ease of access you require. 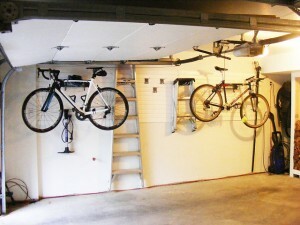 They can help you use both the vertical and horizontal space in your garage to ensure you have enough room to store the entire family’s bikes, no matter how many that may be. It should be an exciting summer for all athletes, but especially for the cyclists. The Pan-Am games are bound to rejuvenate the sport of cycling and the Milton Velodrome just may change the way Ontarians think about biking. 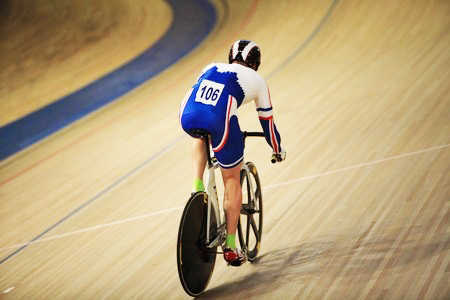 Just ensure that if you take up track cycling you know the rules, purchase a great bike and store it securely. 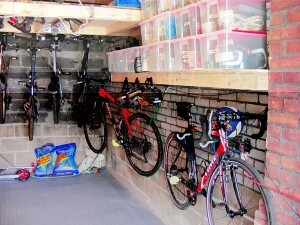 In my last post we addressed two storage challenges you might be might be facing in your garage. Storing oversized items like building materials, winter tires and canoes can be a real pain. This problem is compounded if you have lots of space that feels “unusable,” like tight, odd corners or wasted overhead space. We discussed four ways to make use of “unusable” space in your garage: custom-built overhead platforms; custom-built or customizable cabinetry; custom-built slings; and other custom-built options. 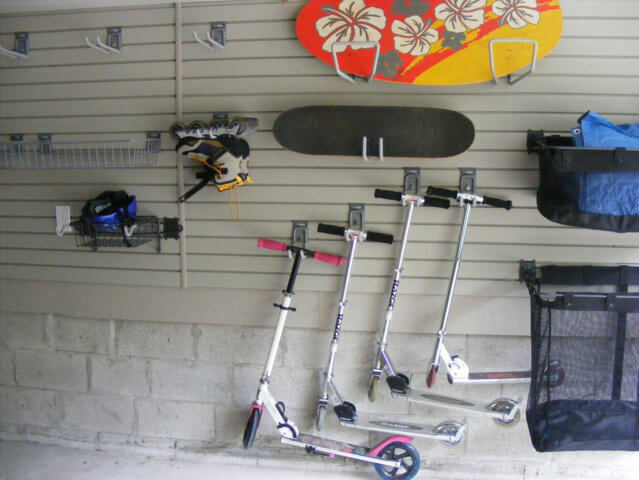 Now let’s explore how Nuvo Garage has used these creative solutions to combat storage issues. 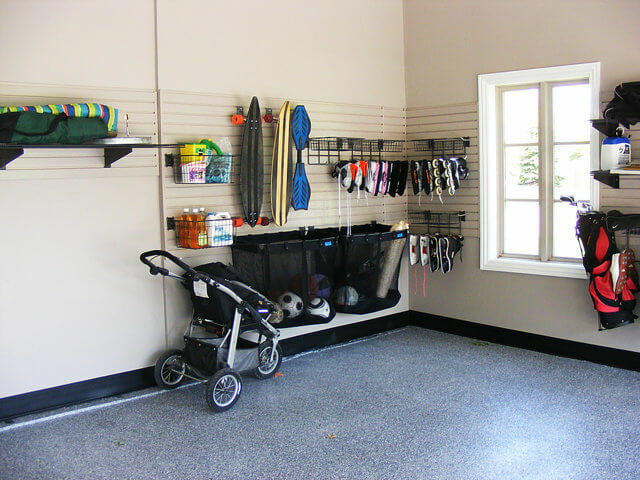 The client’s garage had become a cluttered space where the family dumped anything that didn’t have a designated space or that they weren’t using. The garage had finished walls and a peaked ceiling, but not much else. 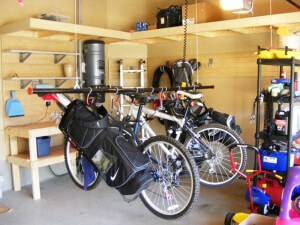 The family needed room to park one car and all of their bicycles, tools and assorted sports equipment. To create the storage space that these clients required, we took advantage of the peaked ceiling by constructing an overhead rear wall mezzanine. We framed the mezzanine with a glass and aluminum railing for safety. A retractable ladder was installed to allow access to the mezzanine without sacrificing floor space. See the complete transformation here. 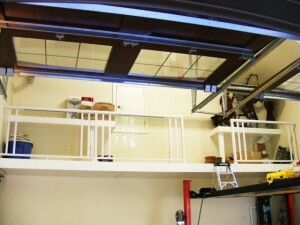 The clients had already purchased a car lift to be used as a “second story” of storage. While it did provide a bit more storage space, this option didn’t meet the clients’ needs. 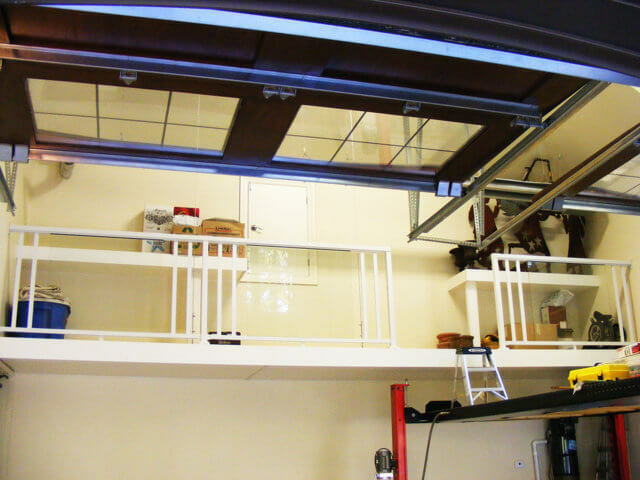 They needed a viable storage solution that would allow them to take advantage of the considerable ceiling height in their garage. We incorporated the car lift that the clients had already purchased into the design. Rather than using the car lift to store additional items, it serves as a lift to raise people and things from the ground floor to the second-story mezzanine. Two tables were built to create additional workspaces on the second-story mezzanine. The raised platform was framed with an elegant, tempered-glass railing. This was important to the clients because the raised platform can be seen through the garage door window. The clients were busy professionals with a young family and lots of oversized items to store. They required storage for two sets of winter tires, a Thule roof rack and leftover house siding in addition to the family’s bicycles and all of the other typical items one stores in a garage. The walls were bare, concrete block, so the family stored all of their items on the floor around the perimeter of the garage. This only permitted them to park one of their two vehicles inside the garage. First, we framed the concrete block walls and installed slatwall so that the family could neatly store bikes, balls, tools and more on hooks and shelves as well as wall-mounted baskets. We installed two racks on the wall, each with the capacity to hold a complete set of winter tires. 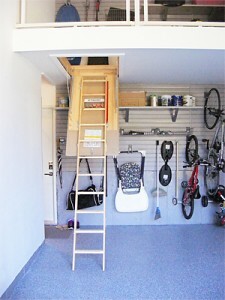 A custom-built ceiling platform was installed to store the leftover siding safely overhead. 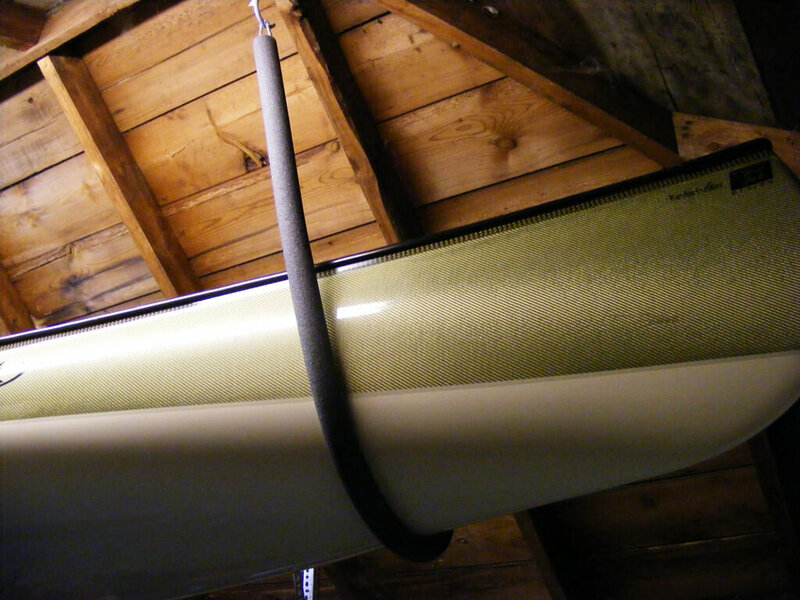 Finally, a custom-built sling was created to keep the Thule roof rack stored overhead and out of the way. Yet, the sling also made lowering the rack onto the vehicle a breeze. See the full transformation here. The client had never parked in his narrow, one-car garage. As an avid cyclist, he owned seven bicycles that had to be stored in the garage. Additionally, the family had garden tools and a variety of other items that required storage. When the client purchased a new BMW, he wanted to park it safely in the garage while also finding space for all of his other important items. 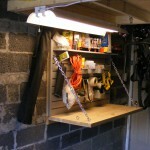 The client also had a challenging item on his wish list for the garage: a workbench for bike maintenance and repair. 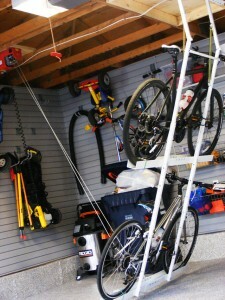 To achieve the client’s goals, we used nearly every square inch of available space in the garage. 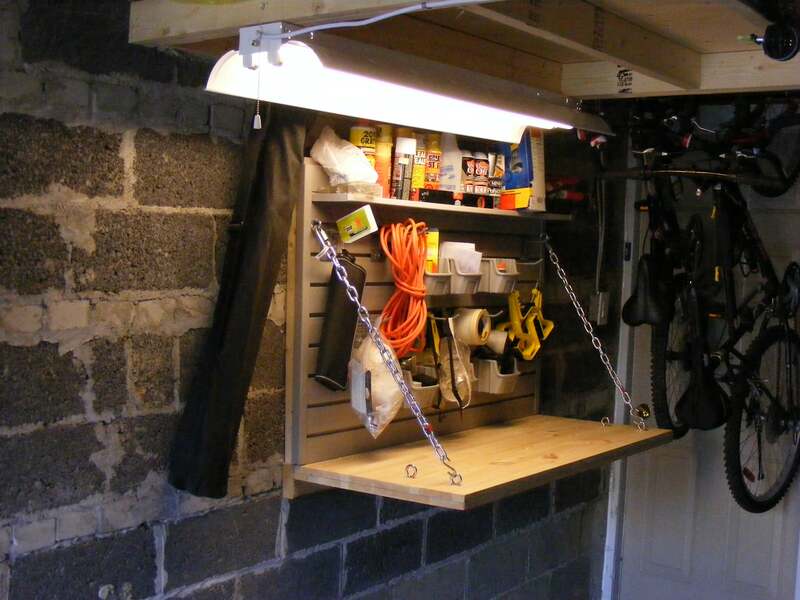 Custom shelving attached to the sidewalls creates a wealth of storage space for bike repair and gardening tools and accessories. Additional storage space for seldom-used items was created by installing custom-built overhead storage platforms. 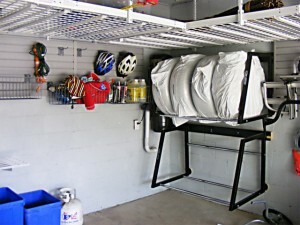 Though the garage was narrow, it was deep enough to accommodate the storage of five bikes hung vertically on the back wall and the storage of two others on a sidewall horizontally. See the remarkable transformation here. 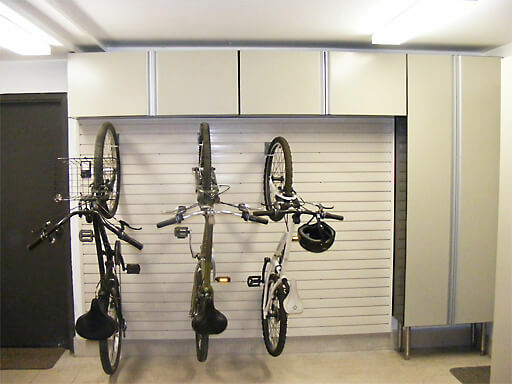 Are oversized items or “unusable” spaces creating a storage challenge in your garage? 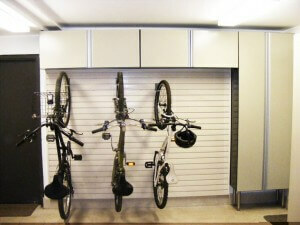 Discover the amazing results you’ll get when we use creative solutions to transform your garage.